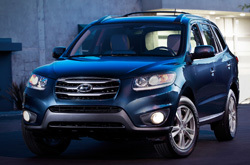 Research from Vandergriff Hyundai on the 2013 Hyundai Santa Fe can be viewed below the video. Where do we get these Santa Fe reviews? From foremost writers in their industry. This Hyundai review article contains everything you need to know about the Santa Fe and it's specifications, mpg and more. Read on, but don't hesitiate to contact Vandergriff Hyundai for more Santa Fe information. Comparing the 2013 Hyundai Santa Fe head-to-head with against vehicles like the 2013 Kia Sorento, Chevy Equinox, Honda CR-V, Toyota RAV4 and the Ford Explorer, and you will realize that the 2013 Santa Fe outshines the competition in loads areas. See our bullets to see why! Feel the [resassurance] that comes along with acquiring topnotch repairs by Hyundai trained technicians, a year warranty on all services, and authentic Hyundai parts. 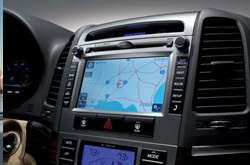 At our Fort Worth area repair center, this and more is available for Hyundai Santa Fe drivers. Hyundais in Fort Worth can take a whipping, so turn to the auto repair masters in Fort Worth - Vandergriff Hyundai. Whether you need us to call the shots on a manageable chore as an oil change, or take on hard to do Hyundai service and repairs like transmission rebuilds, strut and shock repairs, timing belt replacements. Vandergriff Hyundai is your surefire destination in Fort Worth for quick, professional Hyundai service and regularly scheduled maintenance. Click the upcoming link to find service specials now!